It stopped me pretty completely in my tracks. It is such a simple thing to say, but it is something that most of us spend much of their day trying to hide. Simply admitting, “I struggle,” is an extremely powerful thing. I don’t know anyone who doesn’t struggle. Some struggle harder than others, that is for sure, but when you think you see someone who doesn’t, you should remember that you are looking at their outside and comparing it to your inside. I hear from a lot of people who struggle. They get in touch with me to ask for advice or to say thank you or just to talk. It might be nice for them to hear that I struggle too. I would assume that you know that I struggle, but you might not. I know the face I put out in the world and that face struggles far less than my interior. I have walls I put up, both for protection and to hide my struggles. Those struggles are not crisis-level for the most part and are just a part of daily life. Sometimes they are big, sometimes they are small, sometimes they are crushing, sometimes I compensate without even noticing them. How I struggle and about what are not all that relevant here. Saying it, acknowledging it, nodding at it, and continuing on are what I think is the relevant thing. I don’t have much of a point here. I just want to say that I know you struggle and it’s okay. You’re not alone. I struggle too. Maybe I look like I don’t, but I do. I am a little nervous to post this because what if it turns out that, in fact, I am the only one? Somehow, though, I am guessing that I am not alone. * Doctoral candidate Matthew Moore at AutCom. Thank you so much for exposing yourself this way. It made me think. p.s. 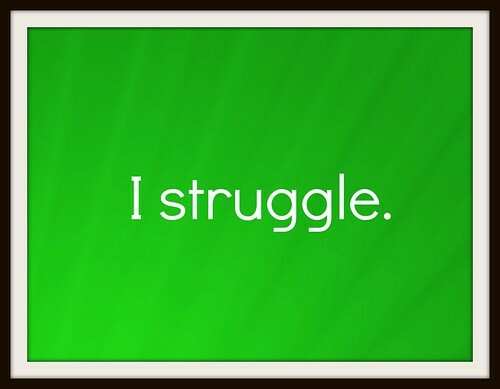 If you’re looking for a word that loses all meaning after you say it a bunch of times, “struggle” is good for that.